Picky Eaters | gather the folks. tell the stories. Wherein, immersed in the RCL’s focus on the sixth chapter of John, I find more and more ways to talk about Waffle Church with other lovely people. 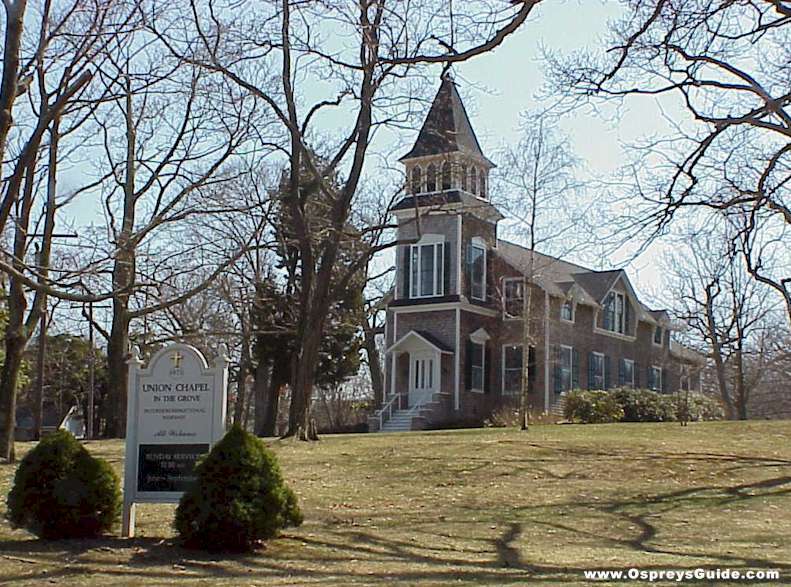 In this case, the lovely community at The Union Chapel in the Grove in Shelter Island Heights. A once-in-a-lifetime invitation that I’ve received TWICE! And wherein, in the heat of the moment, I coin the term “short theologians” to refer to children, who are often more astute and whimsical theologians than the most highly trained adult professionals. It is a joy and a privilege to be here among you again today. I was here almost exactly one year ago, at the beginning of what has been a great transition in my life and ministry. 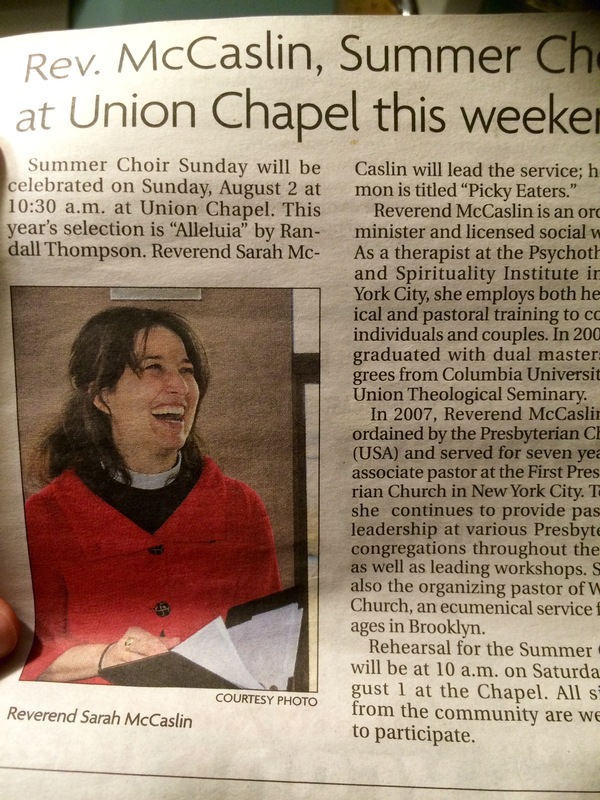 No longer an Associate Pastor of a tall-steeple church in New York City, where I met Judith and Bill Winship so many years ago… and also Bill Buice and our beloved, Stuart. I am now a therapist, a workshop leader, an itinerant preacher, and, as you might have noticed in my bio, the Organizing Minister of Waffle Church. Waffle Church is what it sounds like— church where we eat waffles— and it is a whole lot more. Waffle Church is an all-ages, ecumenical worship service that includes table hospitality within its liturgy. It is an outgrowth of St. Lydia’s Dinner Church, which is also what it sounds like—a worshipping community in Brooklyn that is modeled on the liturgy of the early Christian church. When there were no chapels, no cathedrals or sanctuaries or A-frame churches, but, instead, gatherings of people over a shared, sacramental meal, where the stories of Jesus were shared and interpreted. In addition to dinner, or, in our case, waffles, the bread is blessed and broken, the cup blessed and poured out. The stories of Scripture are told and responded to. There is music; there is prayer; there is movement. And there are children who make noise and fidget and who also serve as theologians in their own right, noticing things that we as adults no longer can. At our first ever Waffle Church workshop two weeks ago, we had twenty adults and nine children, ranging in age from one to 65. I told the Parable of the Mustard Seed from Mark’s Gospel. It is a straight-ahead, familiar parable of a small seed that becomes a large, encroaching weed which, once planted, spreads over everything it touches, not unlike the Kingdom of God. But when I set the stage… when I put Jesus where he belongs, by the Sea of Galilee, with the crowd pressing in around him and spilling onto the beach from the surrounding hill country, so much so that Jesus feels the water lapping his ankles and decides to jump in a boat so that he doesn’t end up preaching to the fishes… the children laughed. They thought it was hilarious. “Short theologians,” I call them, for they are able to appreciate a good exaggeration, to suspend their disbelief in order to ponder a mystery, a willingness to let the story speak for itself, without being raked over the coals by our adult-sized skepticism. In today’s story in John’s Gospel, the crowds are also following Jesus, because they saw the signs he was doing for the sick, and they were curious and some were likely desperate and willing to suspend their disbelief, like children, to see this man who could do miraculous things. And Jesus, seeing the crowds flowing coastward from the surrounding villages, mounts a hillside, to find a better perch, I imagine, or catch his breath, or survey the hundreds… no, thousands of people who had come looking for something. But for what? They could not yet say. And therein begins that well-worn, soft-edged story of a young boy with five barley loaves and two fish, and Jesus, who, giving thanks to God, broke the bread and fed the crowd so that five thousands bellies were filled, with leftovers besides. But Jesus didn’t stick around for coffee and dessert after the big meal. He did not hang back to receive accolades for the miracle or even the crown that those who had observed the miracle wanted to place upon his head. Jesus vanished into thin air, or so it seemed. It’s like a mad caper, now! “Short theologians” would love this part. Jesus and his disciples disappear from the scene, like magic, and like clowns in a circus car, the crowd jumps into a few small boats and rows after them in hot pursuit. The crowd functions as a single, energetic unit with one voice and one pursuit. And according to Jesus, one hunger. You’re just looking for more bread, Jesus says to them. As if that is such an ignoble aim. And here comes Jesus, who feeds the crowd real bread and real fish– complex carbohydrates and Omega 3 fatty acids. Protein and calories to fill the bellies of able-bodied men and women, as well as the vulnerable bodies of young children and the infirm. The miracle was just as much about caloric intake as it was about anything else. Yes, Jesus is the Bread of Life. Yes, Jesus is offering a spiritual bread that endures forever. Yes, Jesus is speaking to the crowd about who he is and what he has to offer that will sate their spiritual hungers and slake their spiritual thirst. And, yes, they didn’t know what exactly they were looking for, but they knew they were looking, and they knew also, at some level, that they were looking in the right place with Jesus. The miracle is about the experience of abundance in an economy of scarcity. This crowd is, by no coincidence, a reflection of an earlier crowd of hungry people asking for real food to fill their bellies. The Israelites, by the mighty acts of God and the leadership of Moses, escaped the cruel hardship of slavery and the calculated suppression of their religious and national identity. Well-sated servitude can begin to appear preferable to starving freedom. It’s an old story, right? The stomach is a powerful force. What does the crowd want from Jesus? They want bread. They do. Unabashedly, they want more of what Jesus provided them on the hillside– food enough to fill their bellies with leftovers beside. The crowd wants the promise that there will always be enough. Which is exactly what Jesus is offering. But we can be picky eaters even when we are hungry. And all along, the promise is there, just waiting for us. “Megillah” is the Hebrew word for scroll and traditionally stands for a group of books in the Hebrew Scriptures that are read in total during certain Jewish festivals. The most familiar of these books is Esther, which is read at Purim. The book of Esther is long and exhaustive; it is not simple; it is not pithy. Yet it is of one piece; it cannot be shortened or condensed and divided up. When you read the story of Esther, you read the whole scroll. Surely, the crowd cannot understand all of these things. Surely, neither can we. Can we really comprehend the theological and existential significance of pouring water over a child’s head at baptism or gathering around the altar during the Lord’s Supper? No. But Jesus does not ask that of us. Jesus offers a hungry people food, in the form of a table– long enough to accommodate five thousand hungry souls and even more, besides. A table where each will receive his or her fill. Where there will be food and drink enough for everyone. But you can’t put the rolls in your pocket and walk away. There are no doggie bags, no carry-out. When you need more, you have to come back to the table. It is not easy to trust that God will provide for tomorrow. It is not easy to walk away from the table without scraps in our pocket, to save some grace for later without the exertion of showing up again. Sometimes it’s not easy to come to the table in the first place. We’ve been burned and doubt that anything at that table can close the wound. Or we’ve felt what we think is God’s absence in the wilderness and wondered why we ever chose to follow in the first place. Maybe we’ve shown up at the table and tried to eat only what is pleasing to us, but left the table feeling empty, all the same. What does it mean to say ‘yes’ to God’s promises? What does it mean to really trust that God will provide for tomorrow? To believe that the God can satisfy our deepest hungers? Trusting God’s promises will not mean getting the dream job, or the recognition we deserve, or the money we’re owed. It will not mean that we won’t get hurt, or suffer loss, or experience illness, separation and death. God’s promises do not amount to a force field protecting us against our perceived enemies or even against the heartache of our humanity. God is not a superhero. God’s promises come to us on God’s term, not ours. But, if we take a cue from “short theologians,” it might mean experiencing a willingness to consider the mysterious, the unknown, or the uncomfortable without a mind to solve, fix or dispel. It might mean that we live with a little more lightness, when we are not weighed down by things and plans and anxieties to meet every possible circumstance. Storing up moldy bread in our pantries, or some such thing. It might mean that we enjoy what is set before us each day with a little more gratitude and maybe even some joy. Not because it portends future success, but because today is a gift that cannot be reopened tomorrow. At the start of the year, in the weeks after I learned that I had cancer, I felt pretty well, despite my liver being half-occupied by metastases. When the cancer in my liver was treated in February … I felt awful for a couple of weeks but then super well, charged with physical and mental energy… I had been given not a remission, but an intermission, a time to deepen friendships, to see patients, to write, and to travel back to my homeland… People could scarcely believe at this time that I had a terminal condition, and I could easily forget it myself. And now, at this juncture, when death is no longer an abstract concept, but a presence — an all-too-close, not-to-be-denied presence — I am again surrounding myself, as I did when I was a boy, with metals and minerals, little emblems of eternity. We all have a terminal condition. Death comes, one way or the other. As Christians, we also surround ourselves with little emblems of eternity: a table, a loaf of bread, a cup of wine, a bowl of water. St. Augustine calls these emblems of eternity “visible words”- the embodiment of the Gospel in the ordinary ‘stuff’ of life. Visible, physical words for visible, physical people. To be touched, and tasted, held and observed, like the metals and minerals of Oliver Sacks’ boyhood. This entry was posted in Discipleship, Sermons, Waffle Church and tagged Bread of Life, children, complex carbohydrates, Exodus, food, Gospel of John, hunger, Lord's Supper, Manna, Moses, Oliver Sacks, Parable of the Mustard Seed, Shelter Island, short theologians, St. Augustine, St. Lydia's, The New York Times, Union Chapel in the Grove, Waffle Church. Bookmark the permalink.